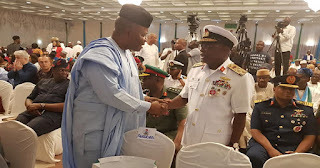 Some service chiefs including the Chief of Defence Staff, Gen. Gabriel Olonisakin; the Chief of Air Staff, Air Marshal Abubakar Sadiq; and Chief of the Naval Staff, Vice Admiral Ibok - Ete Ibas seen attending the event were obtained by The PUNCH on Monday. Speaking with The PUNCH on Monday, the Spokesman for the Atiku Abubakar Campaign Organisation, Mr. Segun Sowunmi, said the presence of the service chiefs at such a political gathering showed that Buhari as the commander - in- chief had compromised the heads of the military agencies. Sowunmi called on the international community to take note of the development as it could imply that the military had already started working for Buhari’s re - election. He said, “The problem with the security agencies is that they have not fully defined who they should be loyal to. The concern is that the commander - in-chief has some sort of relationship with them but when they elevate that relationship to a point where they begin to attend political events at the launch of the campaign of a political party, everybody must be scared. He said,“ It was not a campaign but the launch of a scorecard. You cannot prevent the crowd from chanting ‘APC’ because party members will do what they want. The event was a scorecard involving heads of all sectors including security to showcase their achievements.